The other night I had the pleasure of making my first visit to the German restaurant and bar, Laschet's, on Irving Park. To make the event even more pleasurable, I had the opportunity to meet up there with a number of fellow LTHers, though unfortunately Amata and Lucantonius were not able to be there as well. Despite the fact that I had intended to give up meat for Lent, I ended up consuming and enjoying very much several different varieties of flesh over the course of the evening. Upon arrival at the table of the already assembled LTH group, I was kindly offered some of the Hackepeter, that is, steak tartar, that they had ordered as an appetiser. The beef was very nicely seasoned, served on two- or three-bite size platforms of good bread (rye, I believe), and accompanying the meat were little bowls of chopped raw onion and capers, both of which -- along with a healthy dose of black pepper -- provide the finishing touches to this dish. After having fasted all day, the Hackepeter and nice cool half litre of Jever beer (from East Friesland) was like ambrosia and nectar. Having already transgressed, I did not attempt to resist but rather embraced my turpitude and decided to order for my main course a basic, standard German meat dish with the idea of getting a sense of the restaurant's quality in such traditional fare. 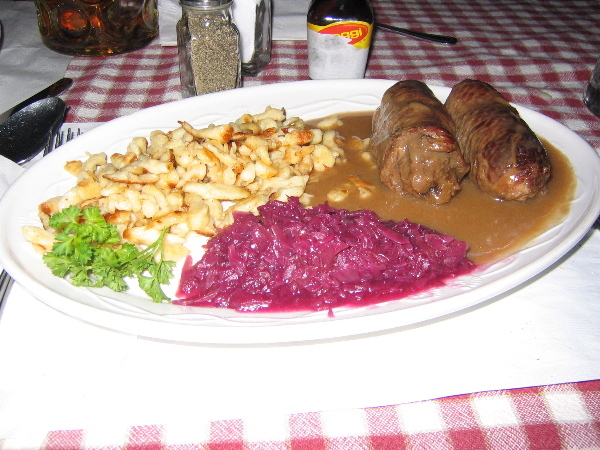 I had the Rouladen (thin slices of beef, stuffed with pork and served with a brown gravy) which came with Spätzle and German-style red cabbage; a very nice house salad was included with the dinner plate and was served as a separate course before the arrival of the meat. In short, I was very pleased with the Rouladen and felt through the food and beer and music as if transported back to my student days in Germany in the age of the RAF. I also was generously offered by GWiv a sample of his Schnitzel à la Holstein (which traditionally is served with a fried egg, capers and anchovies adorning the top of the schnitzel; there were no anchovies but I don't see the dish listed on the menu, so this was perhaps an improvised special request for Gary); the schnitzel was also quite tasty. All in all, I was very happy with the food. As shocked as I am to discover that I had lived in Chicago so long without knowing about Laschet's and Resi's, I am equally happy to know of them now and grateful to the fellow LTHers who informed me of these places and have made two recent visits to this little bit of Germany on Irving Park so much fun. Special characters fixed in wake of the site-move. Last edited by Antonius on April 4th, 2005, 8:05 am, edited 1 time in total. Another one of those meals where only one person WASN'T taking pictures of the food (and she's married to the guy who started the fad). Okay, I guess Thor's parents were there too for a while and didn't take any. I thought Laschet's was highly enjoyable, if I had to pick a kitchen I'd give the nod to Resi's, but good hearty food hit the spot just fine. 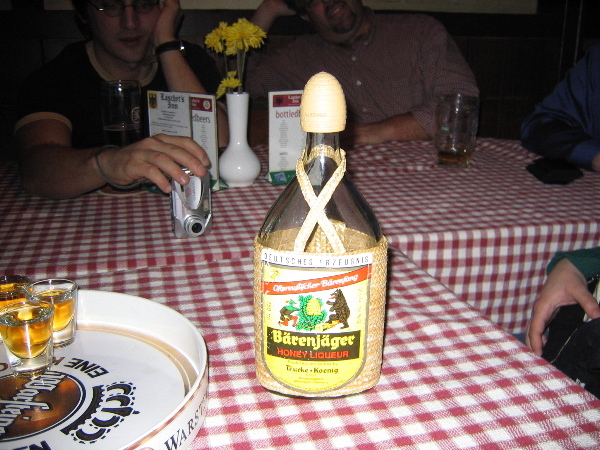 The hackepeter was silky smooth, really nicely prepared, Gary asked our waiter if it was popular and he said it sold like water on some nights, which if you think about it in a German bar is actually not much of a recommendation, but we knew what he meant. Based on that I would like to come back and try the Frikadellen, the German hamburger, which is pork (maybe with beef), onion and spices mixed together. * I also tried the goulash soup which was spicy and meaty, very nice. * NOTE: On a recent visit to Mirabell it appeared that the "Mirabell burger" is no longer made in this style, though it certainly was back in the late 80s/early 90s. Guess I have to order one to make sure, but it's now said to be topped with bacon and cheese, which sounds American rather than German (and as if the bacon is compensating for the disappearance of pork from the patty). 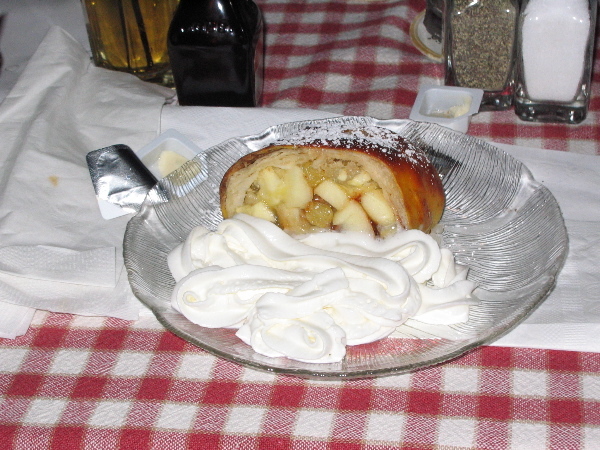 The first liqueur we had, compliments of the house, was Applekorn, which I have also seen on the menu at Mirabell. It was sort of like cider on its way to becoming applejack. As someone who likes sweet wines, I really liked the honey liqueur Antonius suggested, bierenjaeger, but would have enjoyed it anyway just for the 50s style woven bottle cover (reusable). Living nearby, I have known Laschet's existed for years but never went in, Resi's I guess satisfied my German bar needs and I always thought the crowd inside probably averaged 83. Under the very friendly and hospitable new management, at least, it is a very lively and comfy place with amusing German kitsch on every nailable surface. As they say in Austria, "I'll be back." Enquiring Stomachs Want to Know! Two more of the infamously dauntless "pappardelle" ambush unsuspecting plates of food at Laschet's as a member of the security force attempts to intervene. I haven't been to Laschet's in a long time, thanks for the reminder! That sounded like a great time, you'll have to call me the next time you do something like it, I'm always up for German beer. On a Saturday afternoon, Laschet's is a beastly quiet place. On my way to somewhere else, I bumped in to Laschet's first and remembering this post from earlier today, decided it would be a decent stop. I like German sour rye breads quite a bit, I didn't particularly like the bread offered gratis. It seemed to be some multigrain bread, which needed salt. I ordered Rouladen, which was quite fine with pan fried spaetzle and red cabbage. The soup of the day was New England Clam Chowder, which was not what I was hoping for. Liver dumpling was really what I was dreaming of. Instead I had the wilted cucumber salad, which I make often at home, it wasn't as good as mine. My Mom ordered the Leberkase topped with a fried egg, potato salad and sauerkraut. Since the lights were dim, she kept thinking the leberkase (veal loaf) was ham. If it were ham, it had the peculiar bubbles in the texture of processed ham ... you know, ground to a slurry then reformed into 'ham.' Once she was back on track what she was eating, then it all made more sense taste and texture-wise. Mom2 had Liversausage on rye bread with coleslaw and pickle. Three very large slices of liversausage, where 1.5 pieces filled her sour rye bread more than adequately. The remaining amount probably is her dinner this evening. The waiter tried to ply us with apple crisp, which if it were apple kuchen then I would be eager to try for comparison. We were the sole customers this afternoon during our visit of over an hour. IT was so quiet, we found ourselves overhearing a lot of backhouse conversation. Whenever I tried to ask a few questions of the waiter, I wanted to know more how they make their spaetzle, he'd kind of drift away in mid sentence. I guess they are more attentive when they are busy? All you who've posted pix of Laschet's -- incredible. 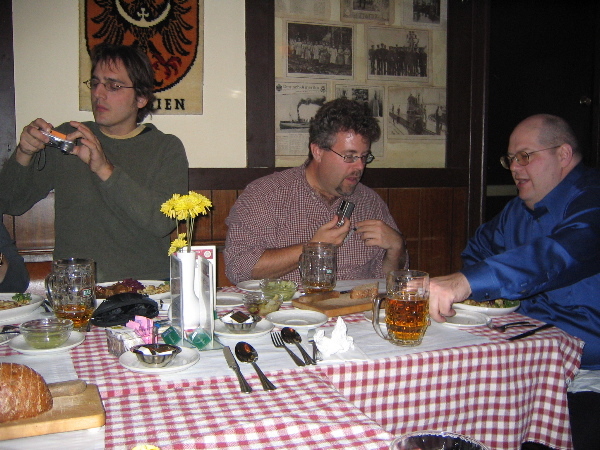 I remember in the old days, there might be one person at dinner with a camera, but it now seems that at LTH gatherings, a camera is de rigeur as a prodigious appetite. 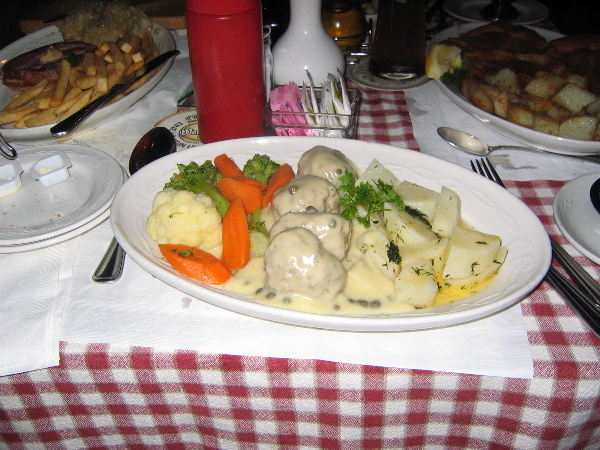 German food is not my favorite cuisine, though I like it well enough, and find it most appealing during the colder months. Based on these delicious pix, though, I'm overwhelmed with a hunger for it...so thanks for that. If I'm debating taking my old-school German grandfather to either Resi's or Laschet's, which should I choose? I've been to Resi's and think the food is fine, but I'm torn b/c I also like the looks of the liter stein in the photos above. If you mark the umlaut with the superscripted two dots, that's it. An alternative spelling is an 'e' added after the vowel that is umlauted. Umlaut dots plus an extra 'e' is, how you say, goofy. * Wie man im alten Lande sagen würde, das wäre ein orthografisches Unding; unter fast allen Umständen nicht erlaubt!. *I'll stand by that but sometimes one tries to represent in writing a dialect that has umlauted vowels with schwa-like off-glides; those can and should be represented with the dots over the prominent vowel and an '-e-' to indicate the off-glide. But the word 'Spätzle' is now standard German and so you should write it that way or else, if your software demands something simpler, you can write 'Spaetzle'. Last edited by Antonius on April 4th, 2005, 8:10 am, edited 2 times in total. As one in the old country would say, "that would be a orthografisches absurdity; under nearly all circumstances does not permit! Good to see a harmonic convergence around Laschet's. I went there a couple weeks ago and had a wonderful time. 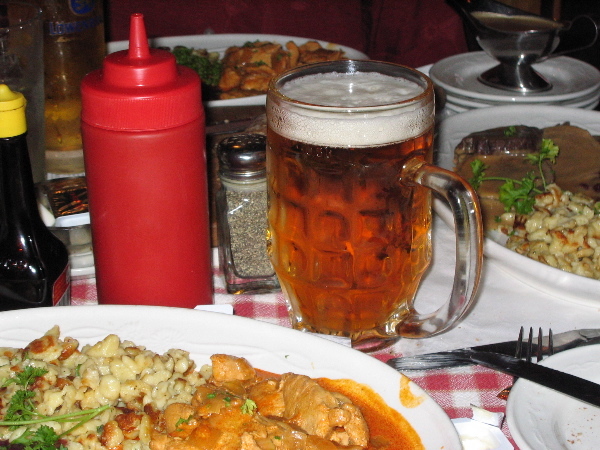 $5 pint+ drafts of great German beer, and very hearty entrees. Good spaetzle indeed, and great atmosphere. My favorite raw-beef appetizer is still kitfo at Addis Abeba but the Hackpeter will do nicely! Hate to be the source of bad news, Addis Abeda recently closed. Their food wasn't the best overall but they were solid and I enjoyed their kitfo more than any other Ethio place in the city. 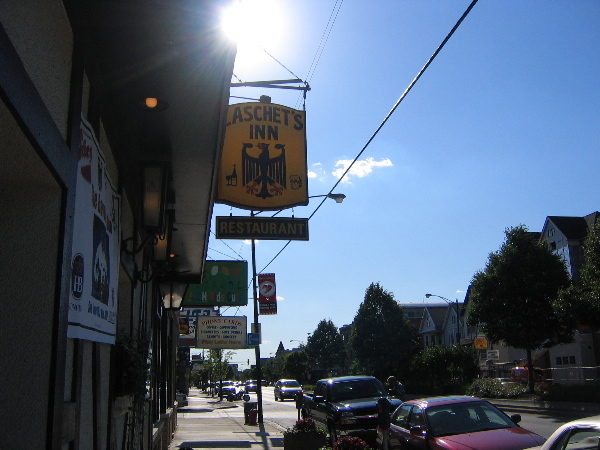 Just went to Laschet's again on Saturday with the girlfriend's full-blooded German family from Milwaukee. The mom said the red cabbage was almost as good as hers (she devoured it), and the dad heartily approved of the sauerbraten and the whole meal, saying it was the best German food he'd hd in a restaurant. The meal took a long time but it was worth it, as everything was fresh and delicious--quite a few veggie friendly dishes on the Lent menu too! As further support for my nomination of Laschet's for the "Great Neighborhood Restaurant Program" I'd like to offer some further notes and pictures on this personal favourite of mine. 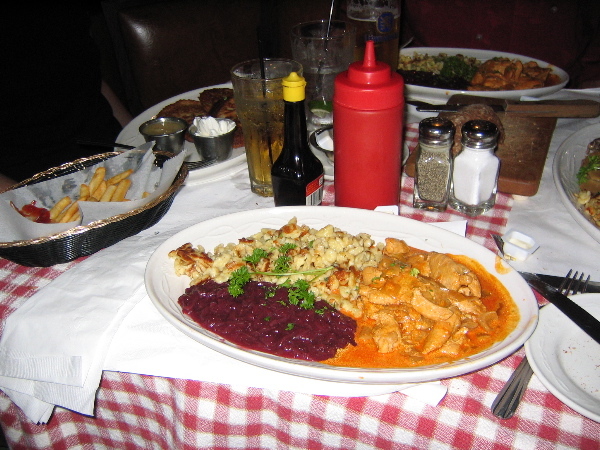 The potato pancakes were first-rate, so too my chicken paprikash and, as always, the Spätzle were beautifully prepared. A tangy sauerkraut soup was also thoroughly enjoyed by all members of the party and before that, while we were considering the menu and the daily specials, a plate of Hackepeter, steak tartar, something which I think Laschet's prepares especially well, was also savoured. I should mention too that something we like to do on Sundays now and again, when out and about in town, is to take a little 4 o'clock refreshment break, as folks often do in parts of northern Europe: something sweet for the little one and perhaps for Amata too, and a couple of nice cool beers for "den Olle"; Laschet's is a great place to stop in for such a little pick-me-up. I just don't get sauerbraten. I've had it homemade by great german home cooks, made it myself, ordered it many times in restaurants, always wanting to like it, and always kind of not. Not as in it's horrible, but I've stopped ordering it because I have recognized that it might just be one of those rare things I just don't like. On the Resi's v. Laschett's, many years ago I and a group of friends were regulars at Resi's, especially after softball games. I love their potato salad covered with a mayonaise and hard-boiled eggs and anchovies. There were often long waits, but I was younger and could fill up the wait with beer drinking. Needing a night out a year or so ago, in the winter, I convinced Himself that Resi's was it. He agreed, somewhat reluctantly (having not even the 1/16 German blood I do, and not coming from a midwest heritage that includes heavy doses of German and mittel-European food that gets incorporated into your family's cooking even if you're Irish). It was loud, crowded, and incredibly smoky. I am the mildest of reformed smokers, I will sit across the table and never object (even when asked by friends I used to smoke with) to an after-dinner cigarette or cigar. I will enjoy music in bars and then the next day be surprised at how much smoke my clothes have absorbed without my being bothered. This was a different order of magnitude entirely, I have not been back because I can't imagine that even on a slow afternoon the place doesn't reek, and that's enough to keep me away. If I am wrong, please let me know, as I have many fond memories of Resi's and always liked the food. Brain flash on the sauerbraten issue--every time I have eaten sauerbraten, I end up thinking how much better I would like it if it were my Michigan Irish papa's pot roast, made in infinite variations, depending on the season and the market. Or one of the variations made my mother, or me. Or a good Jewish baked brisket. In the spirit of culinary self-analysis, I should also reveal that I come from a no-gravy family. Sauces, stocks, pan juices, yes, but a gravy made from pan drippings and flour, etc., not part of the family culinary lexicon. The drippings were used, but typically deglazed with stock or water and saved for the inevitable leftovers. No exceptions to this rule, we did not have gravy with roast beef, we did not have gravy with the Thanksgiving turkey. When you think about it, that makes some sense. Nobody wants to eat leftover gravy, and the drippings were too valuable a resource. I personally think that Sauerbraten is one of the great dishes of Europe, but making it properly is all about achieving a delicate balance of multiple assertive flavours and it is not so easy to get the balance right (and surely, different people have different ideas of precisely how the balance should be). Of course, one is likely to prefer the approach one knows from family, and I readily admit that I think my mother's version was generally excellent. In restaurants in the States, I find it almost always disappoints, sometimes offends, and nowadays I rarely order it. But, that said, I can imagine some folks just not liking the combination of flavours, however precisely the 'balance' comes out. I know there a few classic dishes out there (I'm thinking especially of a certain Mexican dish at the moment) that I should love or at least like and that I've tried multiple times and, in the end, they just don't appeal to me. I have become a pretty regular customer at Laschet's, both for dining and for drinking, and have expressed my affection for that establishment at length above and elsewhere on the board. But I also really like Resi's a lot, and without doubt, their German potato salad (first recommended to me by JeffB) is really delicious. I've definitely enjoyed the (few) meals I've had at Resi's and I love their beer selection; it also helps the beer experimentation process that the main fellow who mans the bar (I don't know his name) is also a very nice gentleman who knows well the beers he sells. But you're right that the indoor space is sometimes very smokey. On the bright side, during the warmer months, they have a beer garden! This sauerbraten thing drove me to a cookbook written by an old friend of my mother, a great cook who explored ethnic cuisine very early in the "foodie" revival in this world. When my mother died, Molly asked my dad, who asked me, for a pan from my mother's kitchen to remember her by. She has a recipe for what I think must be a German-Jewish dish (Molly was a convert RC) that is basically a fish aspic, she recommends salmon, which I have always used, although she says other fish can be used. It is basically a strong court bouillion, poach the fish, flake the fish, and then mold it either using a clear aspic of the court bouillion or one that incorporates crushed gingershaps. That is the one I have made, several times, and have always loved. Eat! You look so thin. Not that it matters to me, but is Ursula still doing the cooking or did they hire help? Eat! You look so thin. wrote: Not that it matters to me, but is Ursula still doing the cooking or did they hire help? I believe it is she who does most of the cooking, though I'm not sure why/from whom I have that impression. I'll inquire next time I'm in (and that will be soon!). I was honored to attend the GNR presentation dinner at Laschet's and I ordered sauerbraten for the first time (at Laschet's). This dish didn't entirely work for me, although I wouldn't say that I disliked it. The balance that Antonius mentioned was simply not there. The acidic tang of the vinegar dominated the meat, gravy, spatzele, beer, everything. Again, this is not to say that I disliked the dominant flavor, but I would have preferred more balance. On a more "macro" level, it was a fantastic meal. Beer, wine, apple schnapps(? ), hackpeter, liver pate, fried mushrooms, roasted veal, and spazele. It all fell together so well. It was Petit Pois' first visit to Laschet's and she is as charmed as I am by the food and atmosphere (the company of LTHers didn't hurt either ). If you haven't been to this great neighborhood restaurant, you're missing out. It's quickly moving to the top of my list of my favorite little hideaways. Uncertain where to have dinner tonight, a friend and I ventured to Laschet - prompted by reviews I've read here on LTH. It was the first for both of us, although my friend works two blocks down the street he's only before been to the restaurant’s bar for a drink and a sandwich. The experience was okay, maybe good - but not great. We chose the appetizer of crab cakes and the three cakes were nicely done; moist on the inside. Split pea was the soup of the night but I selected the house salad, which was a delight - a nice mix of greens. 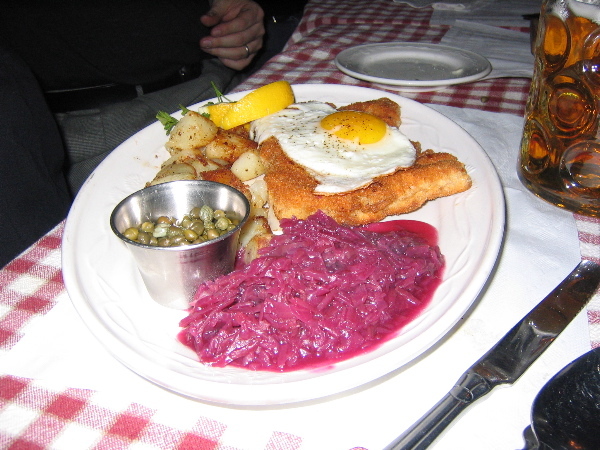 For my entree I chose Weiner Schnitzel which was accompanied by red cabbage and roasted potato's (sliced into chunks). A large portion it was but I didn't like the breading on the meat, I thought it very dry and the meat itself overcooked. It was a large portion, however. Potato's and cabbage were okay. My dinner partner ordered Rouladen, spaetzle and red cabbage. It was a large portion. He'd not eaten the dish in many years, and didn't quite know what to expect. I tasted some of it and it was okay - not something I'd order, though. He did, however, take half of it home with him (and, therefore, I’m assuming he enjoyed it). Overall, we found the staff lackadaisical. Service at the bar before dinner was very slow - almost arrogantly so. Our waitress seemed unprepared for her chosen line of work. She couldn't explain some items on the menu, because, she said, "I'm not a German." I did, however, observe the other waiter and he seemed to know what he was doing. When I asked our waitress about specials or dishes that might be available tonight, but weren't on the printed menu, she replied "We're out of the specials." 20 minutes later I overheard the other waiter tell the table next to us about 3 specials still available. When we asked for some bread before dinner we were told "No bread until after you order your dinner." Well, we were drinking and wanted something to munch on until we made our meal selections, but she was not to be convinced. The bus-girl rescued us 20 minutes later by bringing some bread, and we were disappointed with it (the quality of the bread, not with the bus-girl). Only once during our meal did the waitress return to our table to check on us (other than when she asked us if we were ready for the check - without asking us if we wanted to order dessert). No "Germans" were in the kitchen, nor did anybody who might be an owner circulate in the small room. The place was about 75% full though (at 6 p.m.) and people seemed to be enjoying themselves. A woman who might have been an owner/manager was, however, seating people (actually, she pointed us to our table from where she was standing at the top of the stairs leading to the main dining area). So, I tried Laschet - and I think I found it on an off night. Off nights can be very impressionable on first-timers. And my first impression is that this is far from a great neighborhood restaurant. Passable restaurant? Yes. Good restaurant? Possibly. But the restaurant needed someone in charge and it seemed nobody was. The dinner and drinks for two cost us $60. Will I return another time? Most likely. Will that be soon? Not likely. Last night, petit pois and I both had a hankerin' for German comfort food. Normally, this type of craving immediately points us in the direction of Laschet's, but she requested that we give one of the other nearby options a chance (namely Resi's or Mirabell). I agreed and chose Resi's, I haven't been there in years. As soon as I walked in, I was reminded of the differences between Laschet's and Resi's. Resi's is a little more raucous and dive-y. It's more like a pub where you can happen to order food, whereas Laschet's is a larger space where you can comfortably have a multi-course meal. (Maybe the tablecloths make the difference). Regarding the food, the only thing I was disappointed in was the "house salad", a plate of iceberg lettuce and mealy tomatoes and cucumber. Actually, disappointed is too nice a word. I was terrified by the very sight of this salad. We ordered two entrees: rahmschnitzel for the lady and a boiled pork shank for me. The schnitzel was tasty and comforting. The gravy had the flavor of the powdered Lipton beef stroganoff mixes that my mother used to prepare when she was too tired to cook. Not exactly a dish that I'd order again, but I did enjoy eating the buttered noodles soaked in the gravy. My pork shank was visually impressive (I regret not having my camera). I'd venture a guess that there are very few places in town that have the guts to serve a hunk of a pig, skin on, at their bar. This particular part of the pig, as I expected, Was mostly fat with a few nice hunks of meat. The meat was silky, rich, and flavorful. This is not a dish for everyone; you have to get a bit of primal joy out of digging through pork fat, skin, and bone to get at every little morsel of meat. Also, you have to have a shameless sense of adventure, as there will probably be one or two people around you who find the mass of animal in front of you to be a little distasteful (I know that the two urban hipsters next to me at the bar thought so--If I have to put up with their cigarettes, then they have to put up with my pork shank). The pork was served with a tasty cold potato salad and a warm sauerkraut that might have been from a jar, but it was quite good. I do know that Resi's is famous for their potato pancakes, but they just weren't in the cards for me that night. I will be back for a plate. In the final analysis, I enjoyed my meal at Resi's, but I'll be hard-pressed to stay away from the south side of Irving Park the next time I crave German. There's a level of care and love in the food and experience at Laschet's that is unmatched. Resi's, while good, felt a little more "thrown-together". It is probably unfair to compare the two as they seem to serve two seemingly similar clientele, but clearly divergent purposes in my eyes. One side-note. Resi's kitchen and bar operate on separate systems, so if you want to sit at the bar, have a beer and order dinner, you're going to have two separate tabs (which I found quite annoying). While you describe a good meal at Resi's, I can't help but think you caught them on something of an off night. "Thrown together" is the last way I would describe any of the meals that I have had from the tiny kitchen. All of the pre-made stuff is prepared earlier in the day by the matriarch of the bar (kraut, potatoes). The a la minute stuff is generally pan-fried in good butter to order. Schnitzel is a good call, but some of the gravies are based on things such as rehydrated dried mushrooms. If you check out places such as Meyer's and Paulina, you will see the German propensity toward (expensive and presumably high-quality) gravy mixes. While Resi's takes pride in offering this stuff, I'm not a fan either. If I'm getting schnitzel, it's going to be Holsteiner (with a runny fried egg and anchovies, rather like Argentine milanesa al caballo). I also am a big fan of the gelatinous pork shank. If you liked it, I encourage you to try the knockout version at Poldanka. The bottom line is, both places are great. We are lucky to have the choice. JeffB wrote: The bottom line is, both places are great. We are lucky to have the choice. I'll agree with that, and it seems that there are a number of ways in which they are a little different such that there are reasons for one and the same person to go to both. I do go to Laschet's much more often but always enjoy visits to Resi's. With regard to schnitzels, one difference between the two restaruants is that Resi's serves pork cutlets, I believe (that's what I've had there), whereas the schnitzel at Laschet's is a veal cutlet. I enjoy both kind of schnitzels and generally prefer Wiener style (breaded and sauceless) or à la Holstein (breaded plus egg, anchovy, etc.). I guess I've already gone on record as being more of a Laschet's fan but again, I really like Resi's a lot too. One non-food-related thing about Laschet's that I especially like is the amount of German I hear spoken there and having the chance myself to speak it as well -- not too many places where that can happen around town. The staff at Resi's is so far as I know all Anglophone and I don't recall ever hearing much German spoken there among the customers (though I know some members of the local German community go there). A fellow LTHer and teammate of mine and I stopped in at Laschet's after a late game the other night and a number of people present were speaking German. The next morning, I got up and headed over to Freddy's in Cicero to buy a few things and there I heard lots of Italian being spoken. I enjoyed that. JeffB wrote: While you describe a good meal at Resi's, I can't help but think you caught them on something of an off night. "Thrown together" is the last way I would describe any of the meals that I have had from the tiny kitchen. I did get the impression that we were there on a bit of an off-night judging by the fact that the place was jam-packed but only one other group was actually eating. The cook was alone and bored. My next trip will be on a weeknight where I feel I'll be more likely to encounter a dinner crowd rather than a blind-drunk crowd. Antonius wrote: With regard to schnitzels, one difference between the two restaruants is that Resi's serves pork cutlets, I believe (that's what I've had there), whereas the schnitzel at Laschet's is a veal cutlet. I enjoy both kind of schnitzels and generally prefer Wiener style (breaded and sauceless) or à la Holstein (breaded plus egg, anchovy, etc.). I, too, prefer the Holstein-style which is offered at Resi's (along with the standard Wiener). Resi's does have a broader offering of schnitzel's than Laschet's due to the inclusion of two different pork cutlets in different sauces. petit pois chose the Rahmschnitzel which includes the creamier of the two sauces. She enjoyed the pork cutlet in sauce much more than a standard Wienerschnitzel from Laschet's. JeffB wrote: I also am a big fan of the gelatinous pork shank. If you liked it, I encourage you to try the knockout version at Poldanka. petit pois has requested that our next trip for German be to Mirabell. Neither of us have ever been, I've never read or heard much praise, but we both feel that it is wrong to completely neglect it without trying it for ourselves. Mirabell is reliable but a tad tired, I think. Nevertheless there are some things they execute well and on a night when the place is busy and hopping it has as much gemütlichkeit as any of these places.